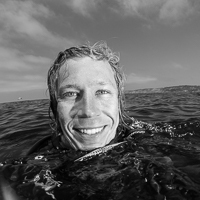 Shooting photos of your dive buddy is a fun way to include them in your dive photo world because let's face it; if you're holding a camera you're probably not paying as much attention to them as you should. Not only does shooting your dive buddy allow you to give them great shots in-action underwater, but it repays them for all those hours spent watching you motionless on the bottom waiting to take that single macro behavior frame. Simple, right? Well there's a bit more to consider for these shots. Adding a dive model to the background of your shots will help create depth by adding another point of interest into the scene. 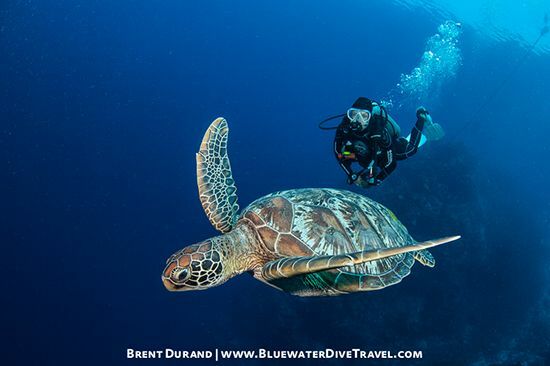 So by modeling, your dive buddy is also helping you to create a more dynamic composition. So how do we shoot dive model photos? 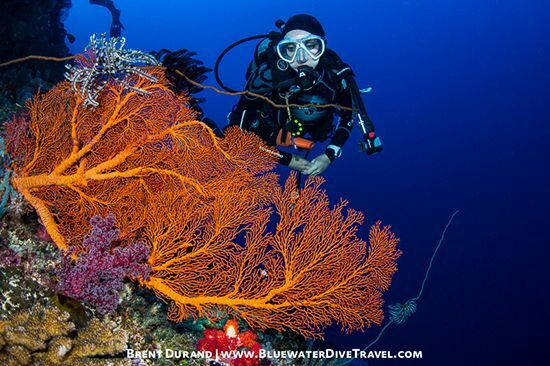 My dive buddy passes by vibrant soft coral. Raja Ampat, Indonesia. It's essential to have an agreed-upon plan with your dive buddy before the dive begins. 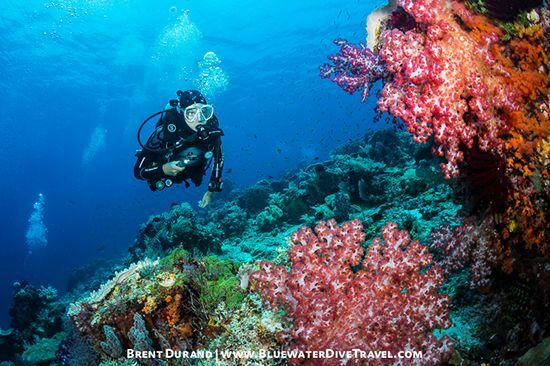 This is fairly easy if you're familiar with the dive site and what to expect, but if you're on a trip to a new dive destination, make sure to ask your dive guide for advice. 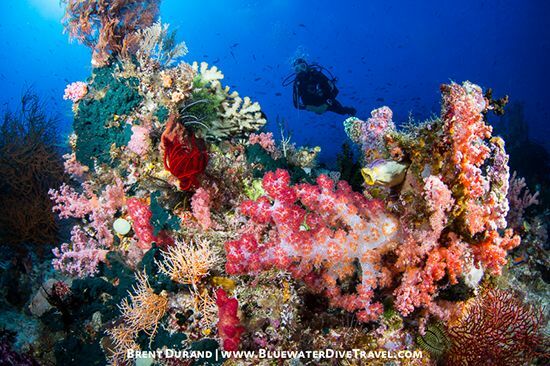 Your guide will be able to tell you if the site is a wall dive, features small hard corals, huge sea fans and barrel sponges, schools of fish or passing sharks. 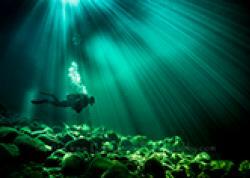 Once you have an idea of the type of shot you would like, discuss this with your dive buddy. Let them know what you're looking for so that if they see you evaluating a wide-angle scene or starting to compose a shot, they will stay close by, ready to model. My dive buddy pauses to admire a candy crab on soft coral. Kimbe Bay, Papua New Guinea. Now that your dive buddy is ready to model for you underwater, you'll need to help them get into position for the photo. Hand signals that you can easily perform with a single hand are best for this, since you'll be holding your camera rig with the other hand. Hand signals should be discussed prior to the dive as well. You'll want to make sure your dive buddy will know to move up, move down, come closer, back up, pivot right and pivot left. Be careful though, because making a fist with your thumb pointed up is the universal signal for "let's surface", so you do not want to use that gesture for directing your buddy. 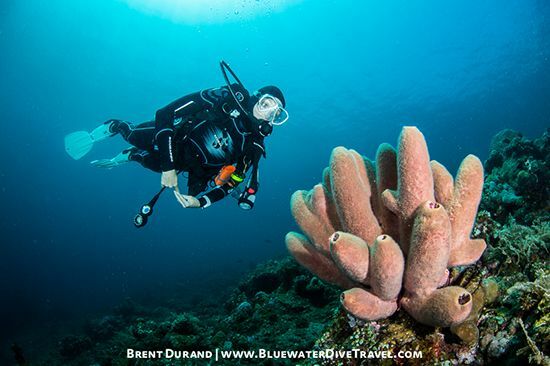 You hand signals can also cover things like "look at the subject" and "keep your legs straight and together" which are common for dive model photos. Once you both have a hand signal language in place, you'll be setting up perfect dive model photos quickly every time! 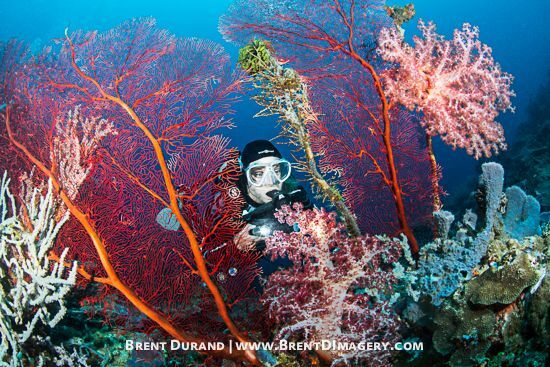 My dive buddy forms a silhouette above this vibrantly colored reef. Raja Ampat, Indonesia. 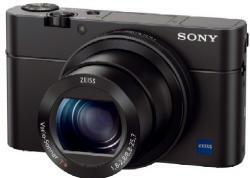 Want to enhance your dive buddy shots? By asking them to hold a dive light, you'll add another interesting element to your composition. The best lights for dive model photography are not standard focus and video lights. You'll want a standard spot beam light for your model, as that will pierce the water with a stronger beam. Since the beam angle is narrower than focus or video lights, it will result in less backscatter in the photo when pointed towards your camera. 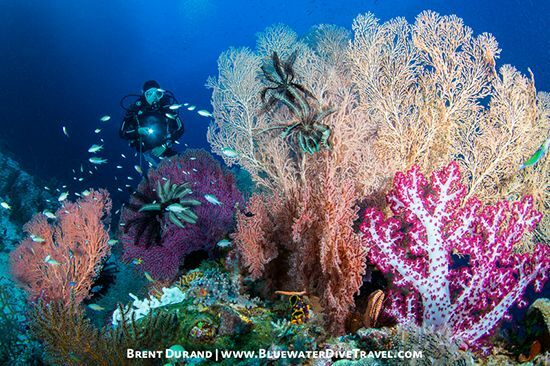 My dive buddy uses a flashlight to bring out the incredible colors of big fans and corals. Raja Ampat, Indonesia. Be realistic. Even with a detailed photo plan and hand signals discussed before the dive, there may be other elements at play that won't allow your dive buddy to be in the perfect position. Maybe there's a current and they have to keep swimming to stay in place. Maybe you're shooting with a moving subject and your buddy just can't get into position in time. Maybe their mask has gotten a bit foggy at the edges. We can't control these things, but a good photographer sees these conditions and then uses them in their photo instead of trying to fight them or become upset with their buddy. Keep a nice, fun attitude because after all, you're underwater scuba diving! 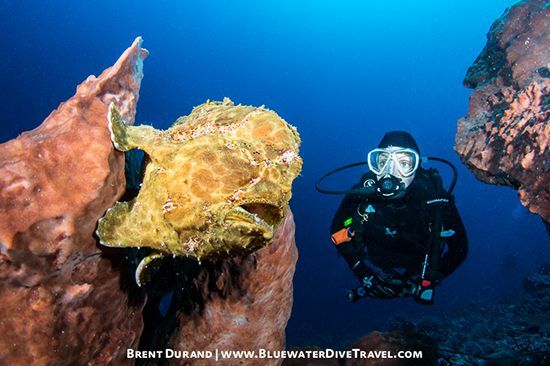 When you find a giant frogfish perched high on a sponge, tell your dive buddy. Bali, Indonesia. A quiet moment along one of Bunaken's massive walls. Bunaken Marine Park, Indonesia. My dive buddy demonstrates keeping your hands trim for photos. Bali, Indonesia. Studying and anticipating marine life behavior has its rewards. Bunaken, Indonesia. Brent Durand is a weekend wanderer, story teller and image maker from California. Brent is editor of UWPG. Follow UWPG on Facebook for daily photos, tips & everything underwater photography. 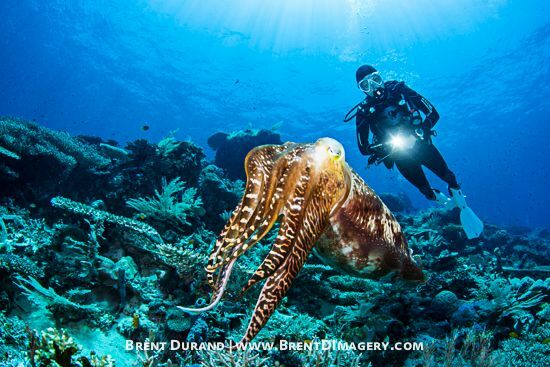 Follow Brent on Instagram, Twitter and his Adventure Blog through www.brentdimagery.com.